The Junta in Burma will no longer enjoy the luxury of distraction. 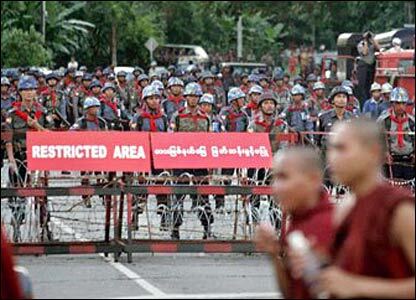 The United Nations plans to keep the spotlight on Burma to bring about reform. Although the intention is good, we as humans are easily distracted by the next crisis. Tainted milk from China seems to be on the front page today. Local news can dominate too. Texas is getting a taste of what global warming has to offer with the damage from hurricane Ike. Thailand is in the middle of a political crisis, and the whole world is holding their breath on the banking crisis in the United States as that will have global fallout if it heads south. So how can a person possibly be focused on other people when news and events that directly concern them is obviously more important. The tropical Cyclone in Burma that killed 138,000 just a few months ago is just a distant memory. This is the challenge that the United Nations faces. As a bunch of Burma related anniversaries are on the calendar, this is as good a time as any to turn on the spotlight. Aung San Suu Kyi’s pro-democracy party marked its 20th anniversary Saturday, and also the 1 year anniversary of the bloody crackdown of pro democracy demonstrators. UNITED NATIONS (AFP) – World powers have called on Myanmar’s military rulers to make “tangible” progress on political reforms ahead of a planned visit by UN Secretary-General Ban Ki-moon to the country. The first ministerial meeting of the five permanent members of the UN Security Council and mostly Asian nations on Myanmar on Saturday also urged the junta to cooperate with Ban’s special envoy to resolve the nation’s political crisis. Envoy Ibrahim Gambari has made four visits to the country since a bloody uprising a year ago but failed to restart a dialogue between detained democracy leader Aung San Suu Kyi and the junta. The talks Saturday underlined “the responsibility of the Myanmar government to demonstrate its stated commitment to cooperation with the good offices (of the secretary-general) through further tangible results,” Ban’s spokeswoman Michele Montas said in a statement. The meeting of Ban’s so-called “group of friends on Myanmar” also wanted the generals to “respond more positively” to international demands for the release of political prisoners, including Aung San Suu Kyi, and a dialogue with the opposition, Montas said. Ban chaired the informal talks Saturday on the sidelines of the UN General Assembly amid little signs the military junta will embrace political reforms, one year after a bloody crackdown on pro-democracy protests. British Foreign Secretary David Miliband expressed dismay that the military junta continued to defy international demands for a release of political prisoners, an end to repression of minority groups and national reconciliation. “That degree of cooperation has not been forthcoming from the Burmese (Myanmar) regime and remains the fundamental tenet of the friends of the secretary general,” he said. “The most important message today is that the people of Burma has not been forgotten by the international community and they remain high on the thoughts of many governments,” Miliband said. UN-based envoys of Ban’s “friends on Myanmar” group had met several times since the group’s inauguration in December last year. The group comprises permanent Security Council members United States, Britain, France, Russia and China as well as Australia, European Union, India, Norway, Japan and South Korea as well as ASEAN states Indonesia, Singapore, Thailand and Vietnam. Surin Pitsuwan, secretary general of the Association of Southeast Asian Nations (ASEAN), attended as the group’s observer at the talks. “What the group is trying to do is to make sure that it is going to lead to some true national reconciliation,” Surin told reporters. The meeting came ahead of Ban’s planned visit to Myanmar by years end, amid expectations that the trip could result in a political breakthrough. Ban made a lightning visit to Myanmar in May after the military rulers came under international fire for not allowing foreign aid into the country after a cyclone left 138,000 people dead or missing. The junta relented at the end after ASEAN said it would act as an aid channel. Singapore Foreign Minister George Yeo said the timing of Ban’s visit was key. “When he goes back, he has to be very careful in time because expectations can be greater … he should not go back unless there are clear signs of progress but his intervention at an appropriate time can be critical,” Yeo said after the meeting. Since Myanmar’s violent military crackdown of pro-democracy protests in September last year, repression “has increased and the military government has failed to deliver on promises it made a year ago,” said Human Rights Watch, an independent US group. The crackdown left 31 people dead, including a Japanese journalist who was shot at close range, according to the United Nations. Another 74 people remain missing and thousands more were arrested. The Security Council is divided on the Myanmar issue, with China and Russia having vetoed previous moves urging the junta to restore democracy and free all political detainees. Last Tuesday, the junta freed seven political prisoners but a day later, one activist was rearrested according to Myanmar exiles in Thailand. Footnote: If you are wondering why some people call it Burma and others call it Myanmar the answer is simple. The junta renamed the country Myanmar, and if you accept the junta then you can call it Myanmar. If you reject the junta, then you call it Burma.